Christophe Soumillon celebrates aboard Thunder Snow as trainer Saeed bin Suroor leads them to the winner's circle. 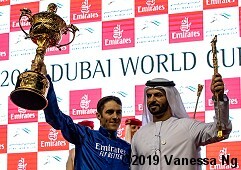 The $12 million Emirates Airline Dubai World Cup (G1), celebrating its 24th renewal, highlights the world's richest day of racing, with $35 million in prize money over 9 races on Saturday night at Meydan Racecourse in Dubai. 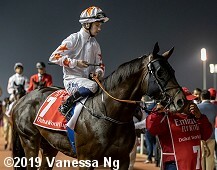 Conditions were typical for late March in the Emirates, with racetime temperatures in the mid 80's and a cloudy sky, the main track rated fast and the turf rated "good". After K T Brave scratched due to colic, a classy field of 12 older horses went to post for this 2000 meter (about 1 1/4 mile) trip around two turns of the main dirt track. Capezzano was sent off as the 7-2 favorite off a 3 race win streak including the Maktoum Challenge Round 3 (G1), the main local prep for the World Cup. In to challenge him included 15-4 second choice Yoshida, winner of the Woodward (G1) before finishing 4th in the Breeders' Cup Classic (G1) and 6th in the Pegasus World Cup Turf (G1), and 4-1 third choice and defending champion Thunder Snow, winless since then including a 3rd place finish in the Breeders' Cup Classic (G1) and a 2nd in the Maktoum Challenge Round 3 (G1). Jockey Richard Mullen sent 9-2 fourth choice North America to the lead first time by through fractions of 26.22, 50.72, and 1:14.21 while pressed by 40-1 Gronkowski and stalked by Thunder Snow and Capezzano. On the far turn, jockey Oisin Murphy sent Gronkowski to inherit a clear lead through 1 mile in 1:39.33 as Capezzano and North America tired. Christophe Soumillon moved Thunder Snow out for room and rallied to collar Gronkowski at the 1/16 pole setting up a duel to the line through 9f in 1:52.03. In the final strides Thunder Snow took over for good, getting the victory by a nose in a photo finish in 2:03.87. 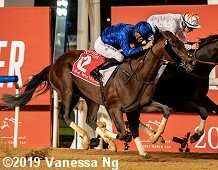 It was another 2 3/4 lengths back to late-running Gunnevera third, while favorite Capezzano weakened at the 3/8 pole and checked in last beaten 32 1/2 lengths. Results Chart for the race from Emirates Racing Authority which includes a link to the video replay. 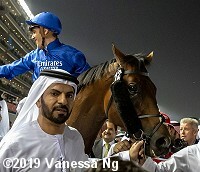 Thunder Snow in the winner's enclosure, as the only repeat winner of the Dubai World Cup. 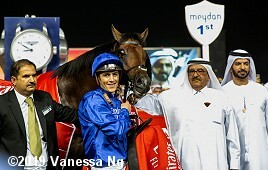 Winning trainer Saeed bin Suroor said, "He is a such a brave horse. I wasn't sure if he had won, but we had the best jockey in the world on board and he knows him so well. 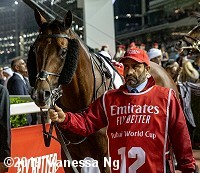 He has won the UAE Derby and now the Dubai World Cup twice on him from wide draws and they are a great team. I think this is my 191st Group 1 winner but it ranks very highly, probably along with Dubai Millennium in 2000 when he won this race." Right: Thunder Snow with his winner's blanket. 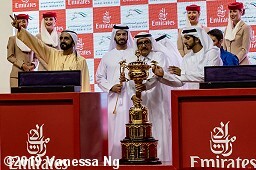 The trophy presentation with owner Sheikh Mohammed on the left. Winning jockey Christophe Soumillon said, "Last year I won by five,six, even more lengths, and today Thunder had to fight hard. I really want to say a big thank you to Saeed bin Suroor, and also to HH Sheikh Mohammed, just before the race they said to me in the paddock you should have so much confidence and do everything right. Thanks to Thunder Snow, because without him I would not be able to do such things." Right: Jockey Christophe Soumillon and trainer Saeed bin Suroor celebrate with the trophy and golden whip. Left: Thunder Snow in the walking ring before the race. Soumillon added, "It was very hard, I was more looking like a Cheltenham jump jockey in the end than an American style jockey but you need to get him going and sometimes you need to do something different. The thing is, I promised to Saeed that I will just have the trophy and he will have the money so I'll have to come back next year!" Right: Thunder Snow heads out to the track. 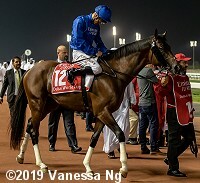 Bin Suroor added, "As for Thunder Snow, I will have to speak with His Highness Sheikh Mohammed bin Rashid al Maktoum, but I would like if he could run in America again. Maybe in New York, in Saratoga with the final plan being the Breeders' Cup Classic at Santa Anita." Left: Second place finisher Gronkowski heads out to the track. 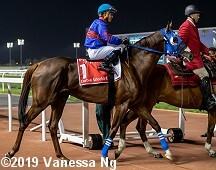 Owner Amer Abdulaziz said, "When you come that far and you get beaten by such a narrow margin, it is so frustrating, but this is also a victory for us. In the end, we were beaten by a better horse but our horse is a great horse. We knew that he was going well, we tried to keep it hush-hush but he's been working so well at home. Salem has done a tremendous job with him, the best of any trainer who has had him so far." Jockey Oisin Murphy added, "I thought it was a very brave effort. We were nearly good enough, just not quite. I spent ten minutes warming him up and I gave him a dig out. I just thought the fancied horses would be ridden prominently and why give them a head start." Right: Third place finisher Gunnevera heads out to the track. Jockey Emisael Jaramillo said, "My horse ran a very, very good race. My position in post number one was no good, but my horse is a beautiful, beautiful horse. It was a very good finish. He finished so good even with the position no good. He gave me everything. He tried so hard. He has so much heart. He gave me all. He was excellent." Left: Last place finisher and beaten favorite Capezzano in the paddock before the race. Jockey Mickael Barzalona said, "We got pushed into the rail after 100m and we were in trouble after that." Right: Shortly after the start with North America out front, Capezzano in the rail, and Thunder Snow in third on the outside.